You’ll find below a list of the most commonly asked questions about Hotel Carmel Rome, and their respective answers. When is the hotel open? The Hotel Carmel is open all year round. Cheap accommodation is available here 365 days a year, and special deals are often available in Rome’s low season. Regular check-in times are between 12.00 and 20.00, although if you expect to be later than this, we will happily attend to your arrival if you advise us in advance. Check out time is preferred before 12.00 on your day of departure. 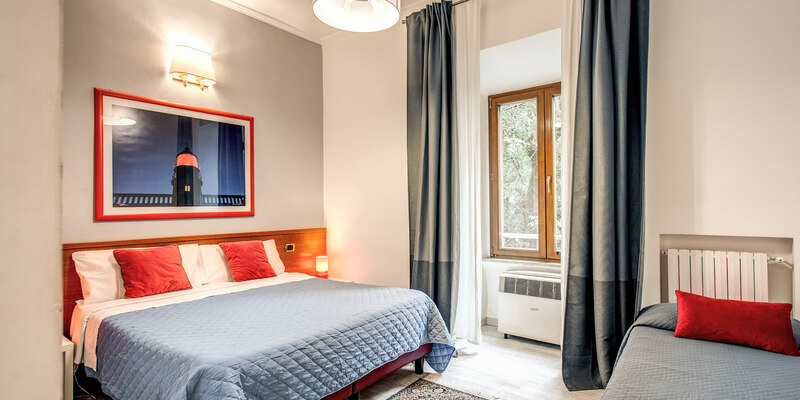 The easiest way from the airports is to take the respective buses to Rome’s Termini station, where you can either take a taxi or the 75 bus which takes you to the stop for Morosini E./Nuovo Regina Margherita hospital, just a minute’s walk from the hotel. For further information, visit our Location page. Do you offer kosher assistance? Yes, we are proud to be one of Rome’s budget kosher hotels and are happy to attend to all your Shabbat needs. Simply advise us on the booking form and we will make arrangements accordingly. A Halavi kitchen is available for use by guests. All but two of our rooms have a private bathroom with toilet and shower. Yes, Wi-Fi Internet connection is available. Yes, mainly used to keep you cool during Spring and Summer. Do any rooms have a balcony? No, however, there is a delightful patio area that all guests can use freely. Yes, just ask at reception for assistance. 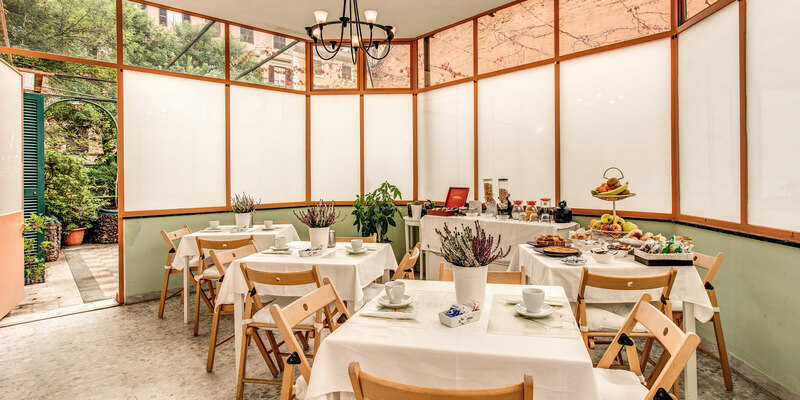 Breakfast is served between 08.30 and 10.00 in the Café Mameli next door to the hotel and costs only €5,00 per person. 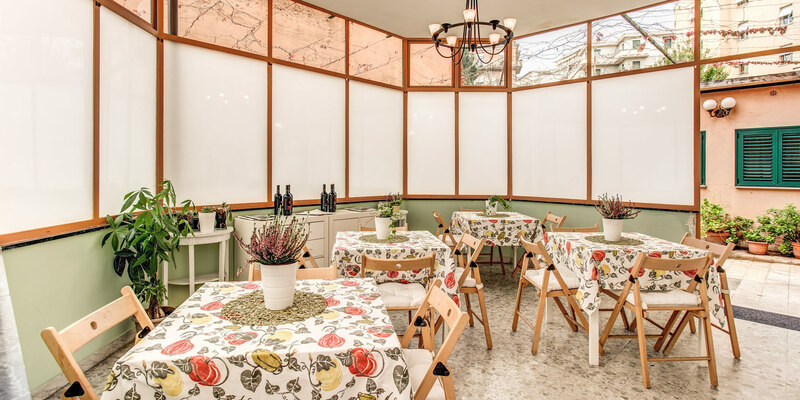 No, however Café Mameli is next door, and there is no shortage of excellent cafes and restaurants in Trastevere where you’ll be able to sample the famous Italian cuisine. Yes. Small pets are welcome if you advise us in advance, although please be aware that for the comfort of all our guests we prefer to insist on as little noise as possible at night. www.trenitalia.com – Purchase rail tickets, view timetable and routes. www.easyjet.com – cheap deals on flights to Ciampino. www.studiopilateselephant.com – Leading Pilates exercise studio offering first class service from certified and acclaimed teachers, near to Hotel Carmel on the banks of the Tiber in Rome. Guided Tours of Rome – Enjoy one of the best guided tours of Rome and Vatican with Lemon Tours Rome. 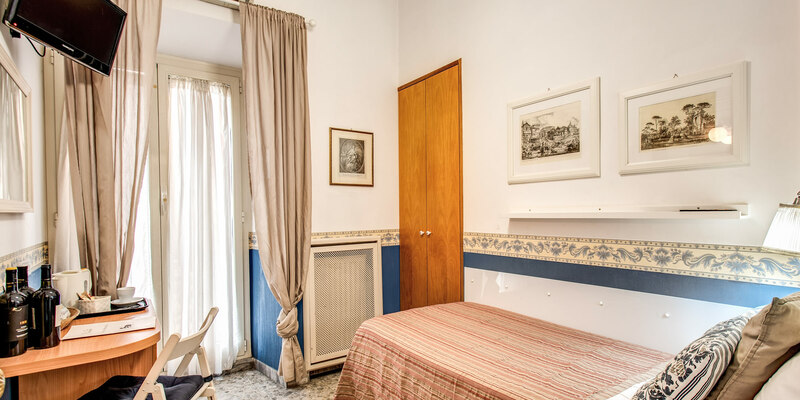 Centergross Bologna – The peaceful and relaxing Residence alle Scuole is a 3 star accommodation in Granarolo dell’Emilia. Mokinba Hotels Montebianco – The Hotel Montebianco has been recently renovated creating a modern and innovative hotel experience. Mokinba Hotels King – The Hotel King Milan is a 4 star hotel located in one of the most prestigious areas of Milan. Mokinba Hotels Baviera – The Hotel Baviera is a beautiful 4 star hotel in Milan.